Stop by our dealership and discover our great offers at Spinelli Toyota Pointe-Claire. Check out this amazing used Toyota Highlander 2018 near Pointe-Claire. Inspected and certified by our experienced technicians, the Black model has logged 15000 km. 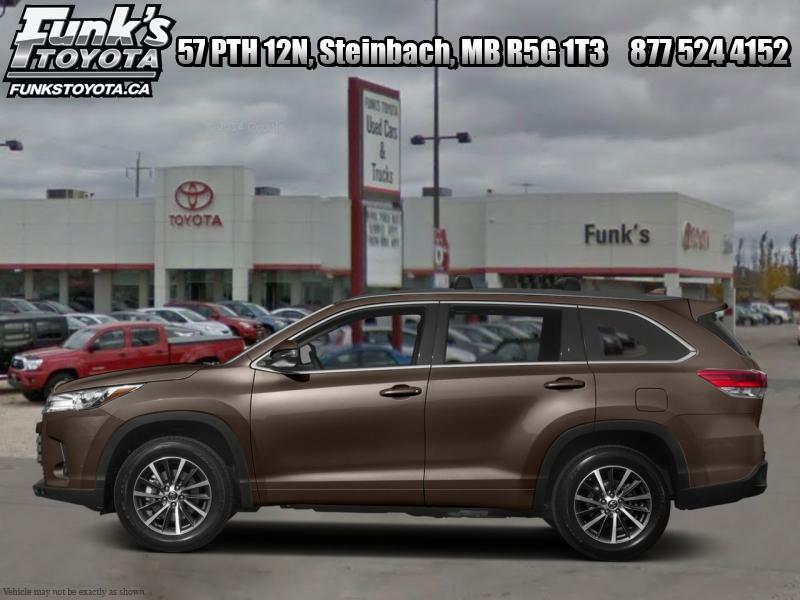 You can buy this pre-owned Toyota Highlander 2018 at a great price of $51810. It's a N/A with 4 doors, Automatic transmission and All wheel drive. This Toyota Highlander 2018 is powered by a 3500cc engine that runs on Unleaded fuel. The exterior is Black, while the interior is Brown and seats 7 passengers. If you'd like to learn more about this used Toyota Highlander 2018 for sale in Pointe-Claire, don't hesitate to contact us by phone at 514 694-1510 or on our web site at http://www.spinellitoyotapointeclaire.com. Make the most of your visit at Spinelli Toyota Pointe-Claire and discover our entire lineup of new and used vehicles. Our expert sales consultants will provide clear and precise answers to all your questions. Don't miss the opportunity to test drive the vehicle you're interested in. We offer financing solutions for all budgets. At Spinelli Toyota Pointe-Claire near Pointe-Claire you will find a vehicle that meets your needs at a great price. And remember that our after-sales service is impeccable. NAVIGATION, BLUETOOTH, 4X4, AWD, TOIT OUVRANT PANORAMIQUE, CAMÉRA DE RECUL, SIÈGES AVANT ÉLECTRIQUES / CHAUFFANTS ET VENTILÉS, MONITEUR D'ANGLES MORTS, SYSTÈME PRÉ COLLISION / AVERTISSEMENT DE SORTIE DE VOIE, RÉGULATEUR DE VITESSE A RADAR, FONCTION AUTOMATIQUE DES PHARES DE ROUTES (DEL), INTÉRIEUR CUIR SUPÉRIEUR, SIÈGE CONDUCTEUR MÉMOIRE, VOLANT AJUSTABLE ÉLECTRIQUE ET CHAUFFANT, ESSUIE GLACE ACTIVÉ PAR LA PLUIE DE PLUS, VOUS OBTENEZ AVEC CE DÉMONSTRATEUR : -LA PÉLICULE PROTECTRICE -SYSTÈME DE REPÉRAGE TAG -PNEUS D'HIVER -DÉMARREUR À DISTANCE MOBILE -MARCHEPIEDS -DOUBLURE DE COMPARTIMENT DE CHARGE Situé à Pointe-Claire, juste à côté de Dollard-des-Ormeaux, Pierrefonds, Dorval, 15 minutes de Laval, à 20 minutes du centre-ville de Montréal et à 20 minutes de Vaudreuil-Dorion, Ile Perrot et de Pincourt et à 40 minutes delafrontière Ontarienne. Répondant aux demandes à travers le Canada, non pas seulement au Québec, notre équipe enthousiaste et professionnelle vous attend. Ouvert 6 jours par semaine, 9 h à 21h, lundi au vendredi compris les samedis de 10-16h. De plus, le groupe Spinelli célèbre 95 ans dans l'industrie automobile et continue sa passion pour l'excellence du service à la clientèle. ---- GPS, BLUETOOTH, 4X4, AWD, ELECTRIC / HEATED AND VENTILATED FRONT SEATS, PANORAMIC MOONROOF, REAR BACKUP CAMERA, BLIND SPOT MONITOR, PRE COLLISION SYSTEM, LANE DEPARTURE ALERT, DYNAMIC RADAR CRUISE CONTROL, AUTOMATIC HIGH BEAM (LED), PREMIUM LEATER INTERIOR, DRIVER MEMORY SEAT, TELESCOPIC AND HEATED STEERING WHEEL, RAIN SENSING WIPERS PLUS, INCLUDED WITH THIS DEMO: -PROTEX -TAG GPS TRACKING SYSTEM -WINTER TIRES -RUNNING BOARDS -MOBILE REMOTE CAR STARTER -TINTED WINDOWS -CARGO LINER Situated in Pointe-Claire, right next to Dollard-Des-Ormeaux, Pierrefonds, Roxboro, Dorval, 15 minutes from Laval, 20 minutes to downtown Montreal, 20 minutes to Vaudreuil-Dorion, Ile Perrot, Pincourt, and 40 minutes from the Ontario border. Dealing with all the provinces of Canada and not just Quebec, our enthusiastic team of professionals is just an email or phone call away. Open 6 days a week, from 9-9pm, Monday to Friday including Saturdays from 10-4pm. Celebrating 95 years of service and a passion for customer excellence. Hello, I found this ad on Auto123.com. Could you please provide me with more information on the Toyota Highlander 2018. Thank you!